In order to see exactly what you have under the paint it needs to come off. That is unless you are doing a cosmetic restore, where you just blow over the paint to make it look pretty and leave all the filler and rust in place. Great if you want a quick sale not so good when you need to do it all again in a year or so but do it properly. The decision was to take my car back to bare metal regardless what it looks like. it’s the only way to see what you have or what you shouldn’t have, such as holes, welds, filler or what ever else lurks beneath a few microns of paint colour. The hood was no different. In fact this was probably the panel I was scared of more than most. I could see the leading edge of the hood had red oxide sprayed on it, there was no lettering on the hood and the underside had some rusty areas. SO the hood was unbolted from the springs and then place on Mustang Maniacs stripping frame they made just for these type of jobs. I wanted to start at the front to see if the hood was metal or filler, which would in turn decide if I needed a new one or not. A fresh pot of stripper was poured out and applied very liberally over the front as I wanted to see quickly, why I was in such a hurry I’m not sure. The scrapper was applied and layer by layer it came off to reveal good metal all be it with some filler to the left side of the centre crease. Once pretty much most of the paint was of the top we flipped it over being supported form the other side to clean up the inside. This was a nasty job, all the little nooks and crannies were a real pain to get back to bare metal. Wire wool, multiple heavy applications of stripper and the scrapper. Eventually it all came of but not without a fight. These layers of paint seemed to be the hardest I have removed so far. Heat from the engine maybe? 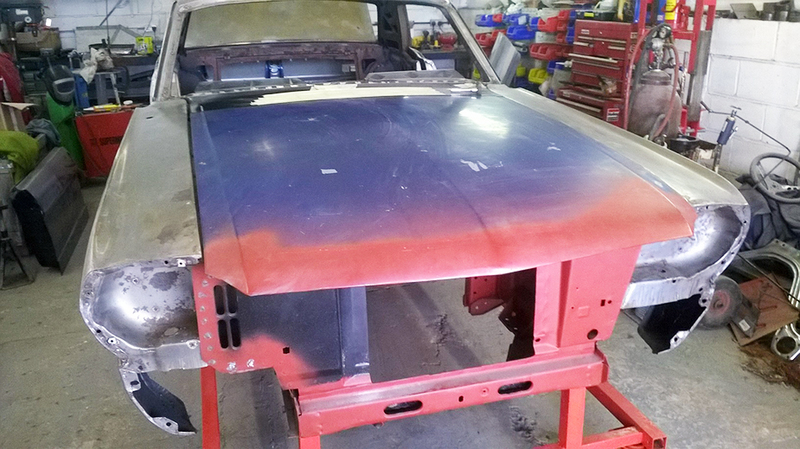 The hood was then flipped back over to the front to remove the filler and the rest of the final layers of undercoat. 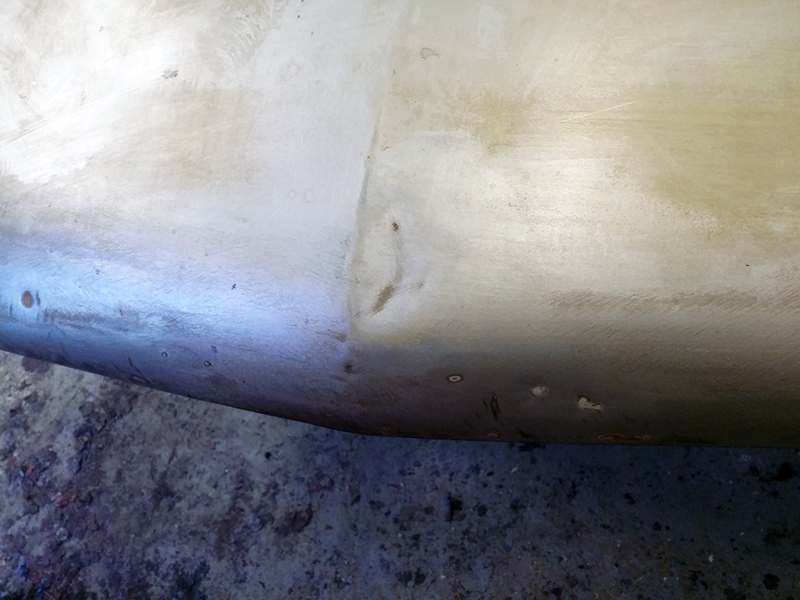 The lead edge had a dent about the size of a small palm and a few stone sdents. This is common as the hood was often shut by pushing down on the front above the latch. This was filled to hide the dent recently before the last paint job. It will be filled again.